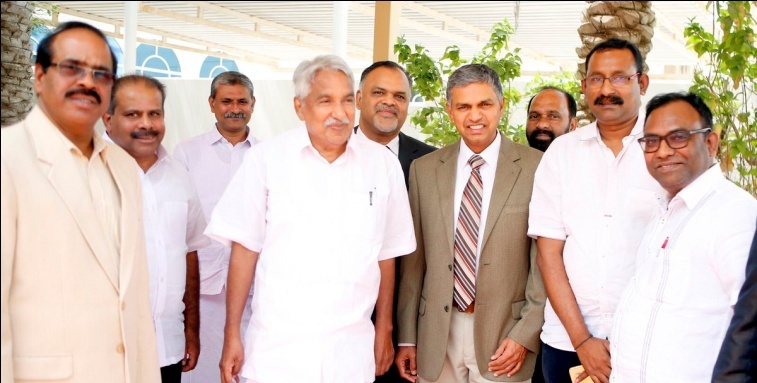 Meeting the former CM of Kerala Hon'ble Shri Oommen Chandy at the Embassy in Doha (11 May, 2017). 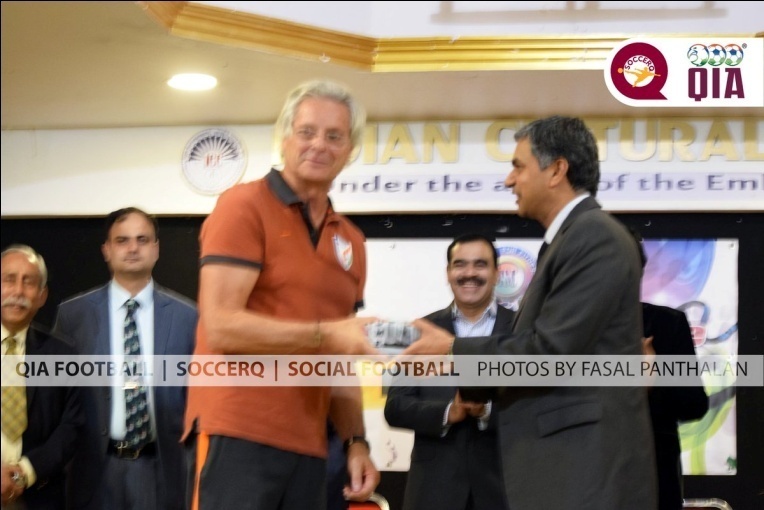 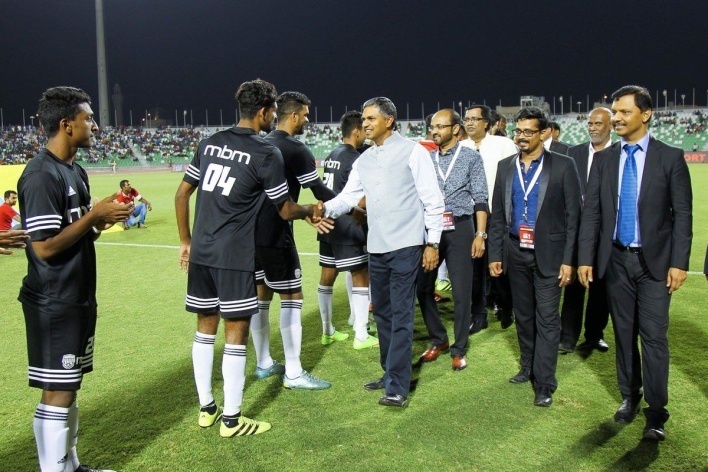 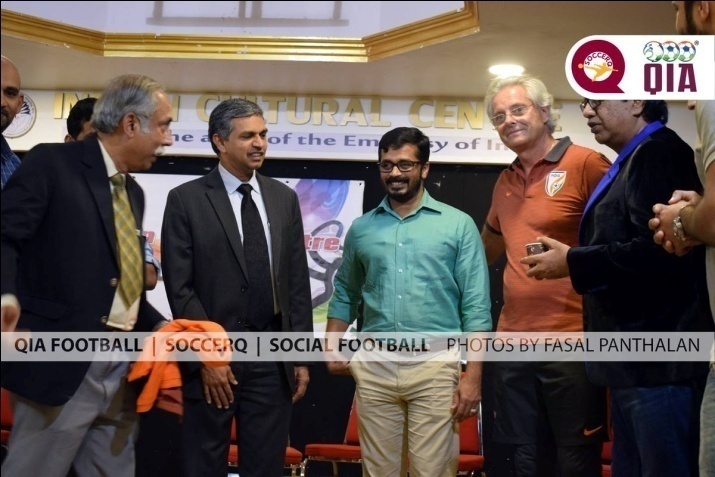 Ambassador at the Community Champions League football tournament organised by the Qatar Indian Association for Football (12 May, 2017). 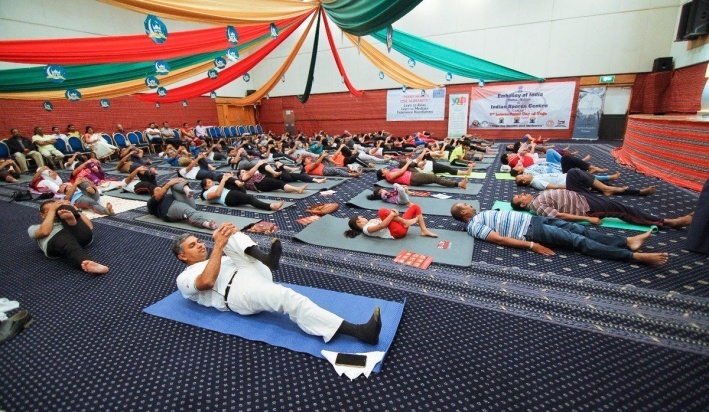 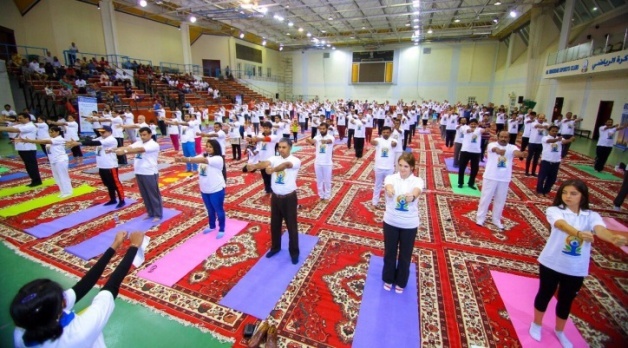 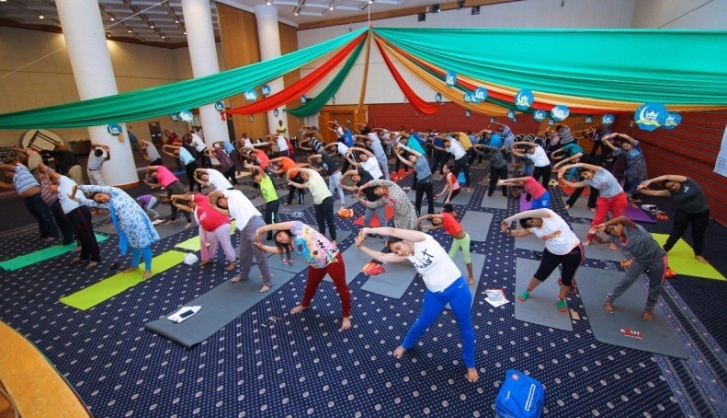 International Day of Yoga (IDY) celebrations at Al Khor Al Waha Club on Saturday 17 June, 2017. 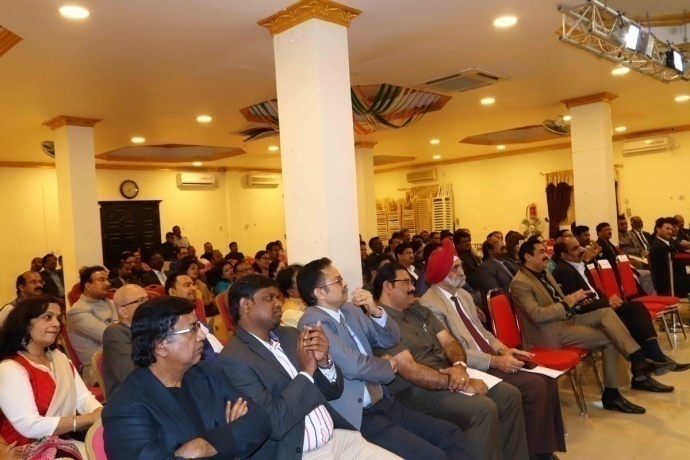 Enthusiastic participation by community. 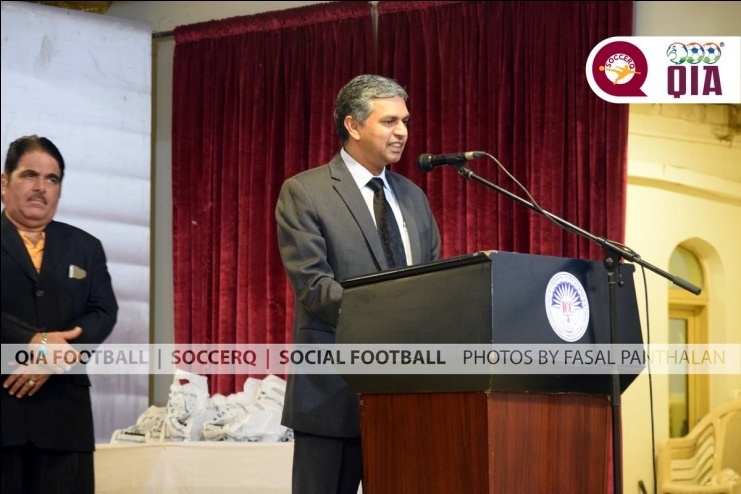 Ambassador Kumaran graced the occasion. 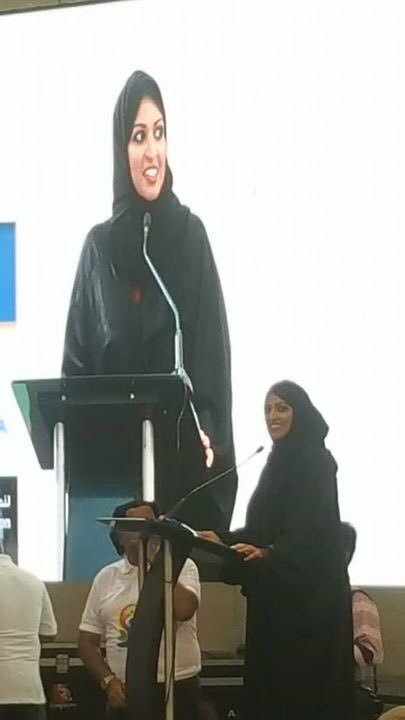 Special thanks to Sheikha Athba Al Thani for joining us at the Third IDY celebrations and addressing the gathering in Hindi ! 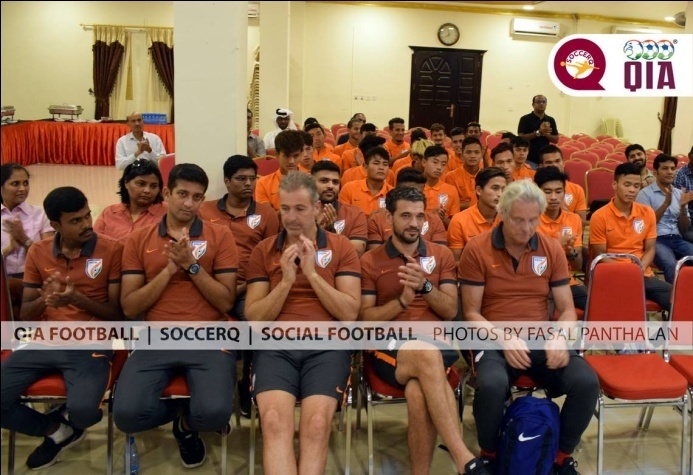 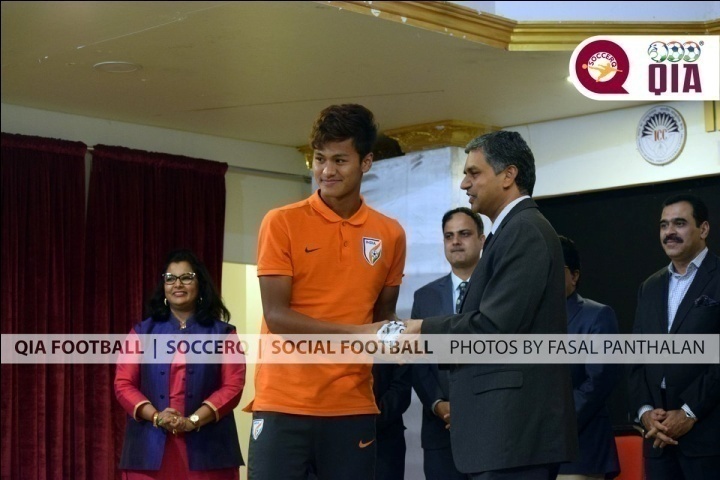 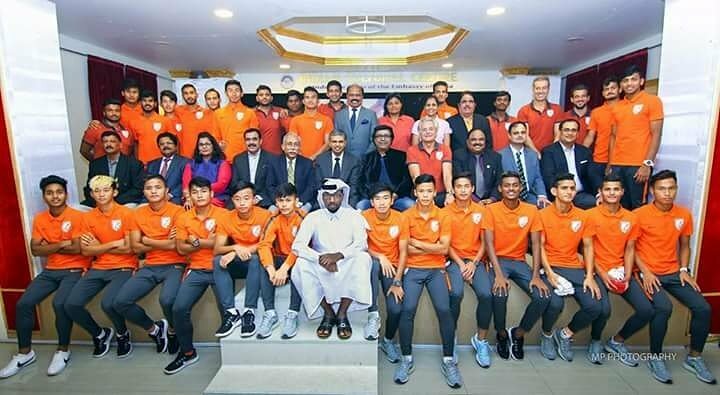 India U23 Contingent Receive Warm Welcome in Qatar (15 July, 2017). 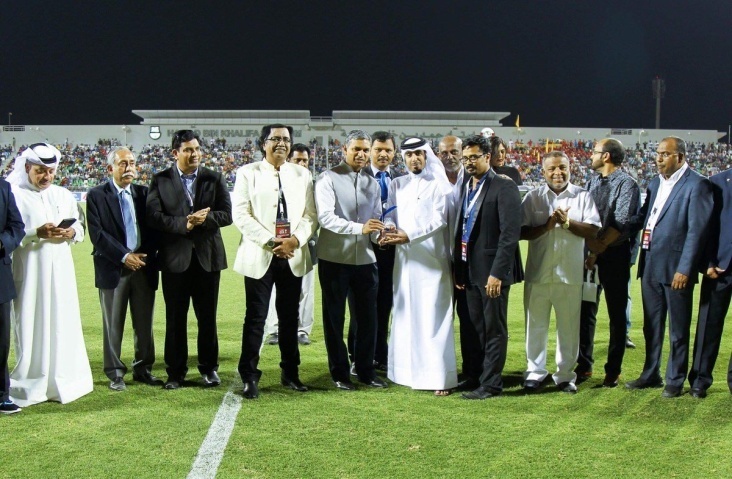 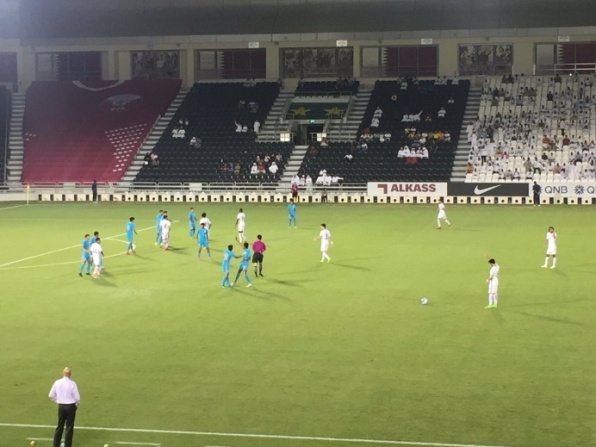 AFC match between India and Qatar. 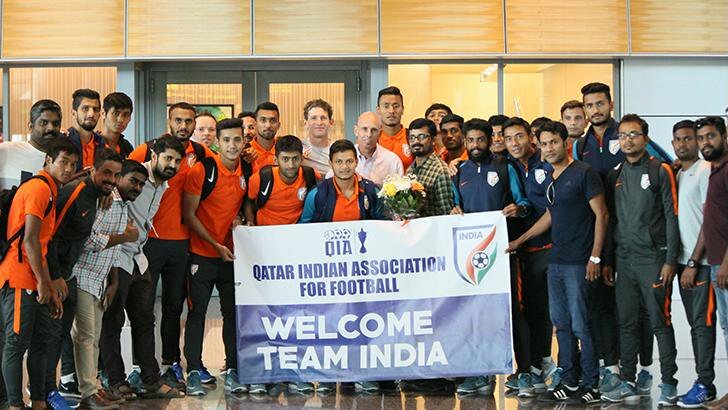 India played well but lost narrowly: 0-1. 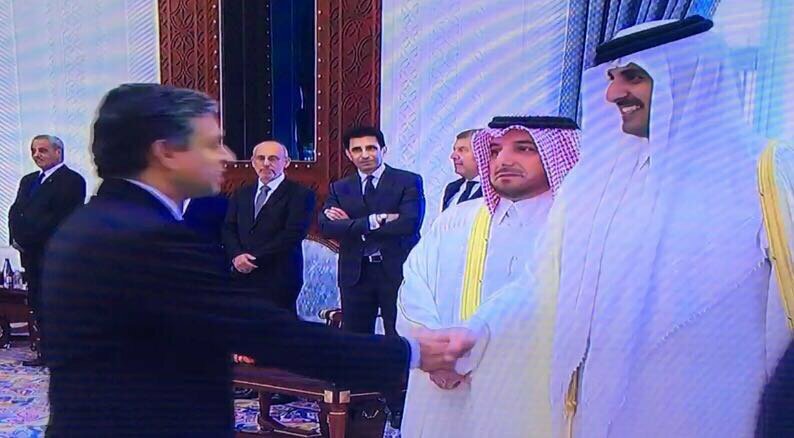 Ambassador wishing HH the Emir of Qatar Eid Mubarak at the Wajaba palace on 30 August, 2017. 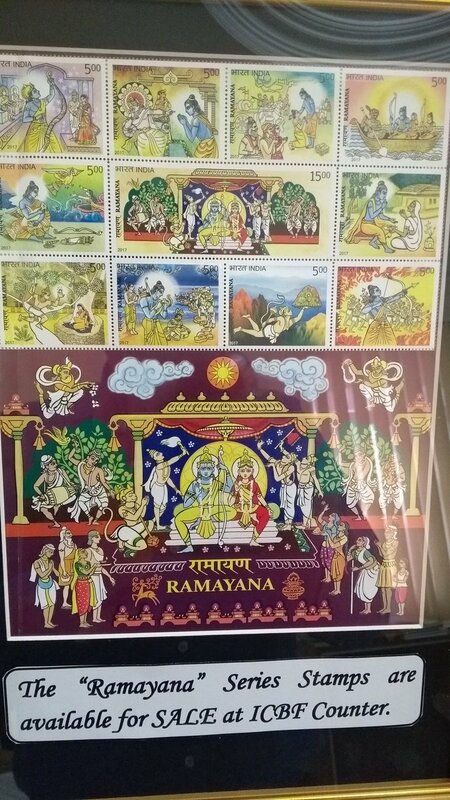 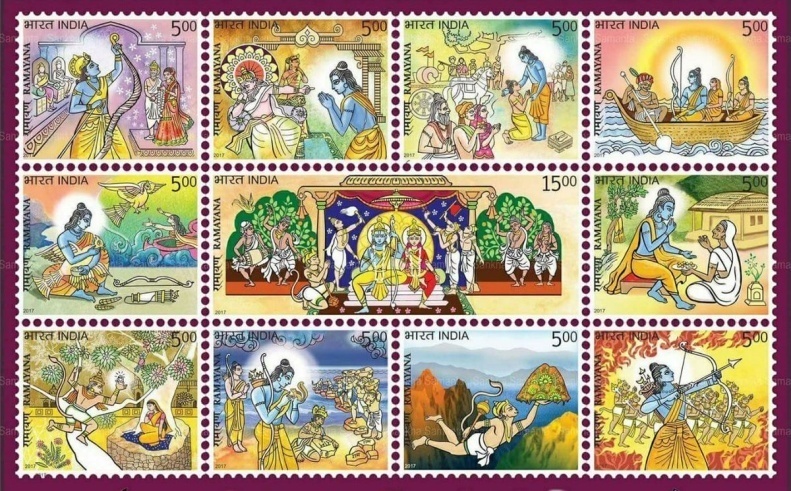 HE Ambassador P Kumaran released the Ramayana Commemorative stamps at the Mission on 22 September, 2017. 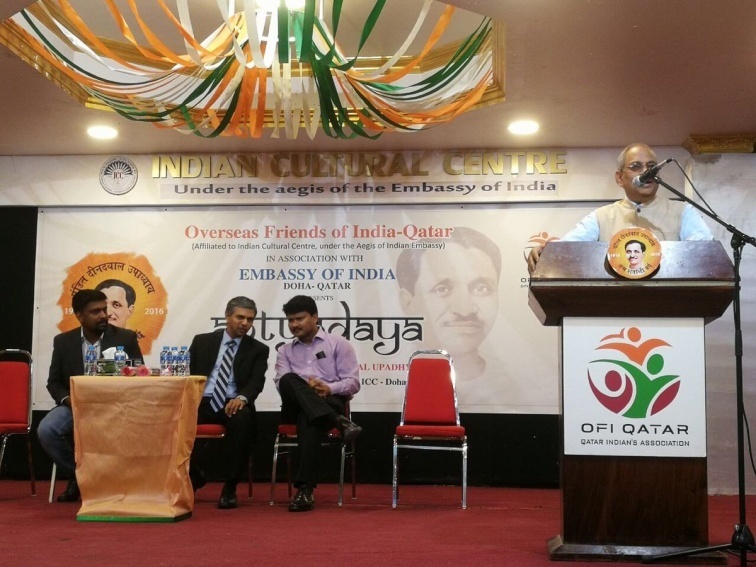 The Mission and OFI Qatar together organised an event at ICC to commemorate the centenary of Pandit Deendayal Upadhyaya, on 12 October, 2017. 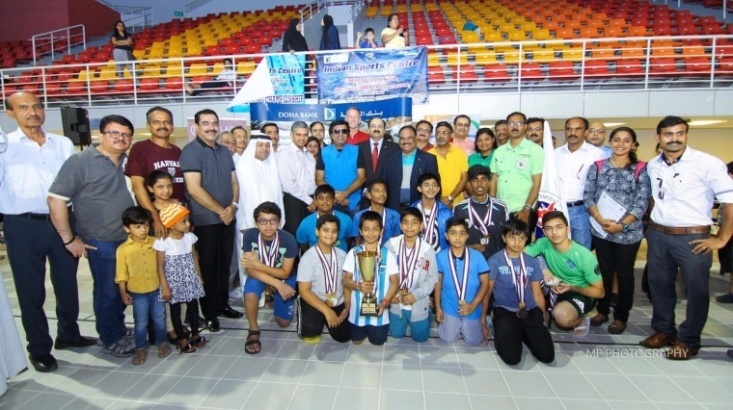 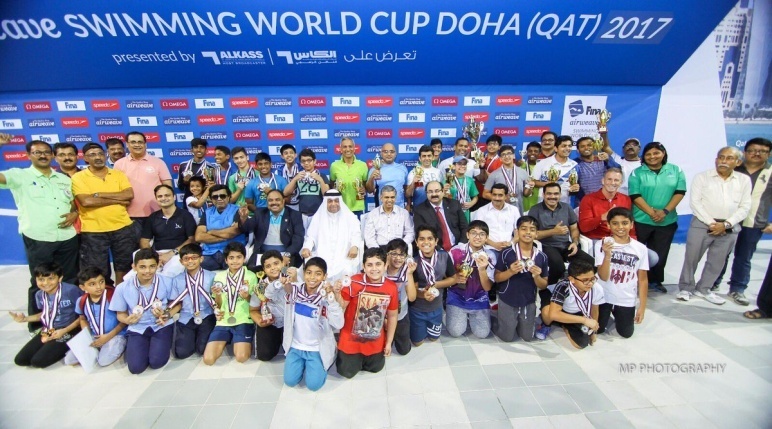 The Indian Sports Centre organised the Inter-School and Inter-Organisation Swimming Competitions at Aspire Zone. 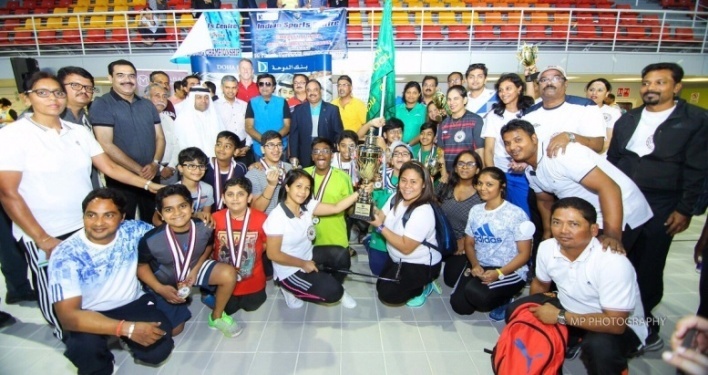 Congrats to the winners! 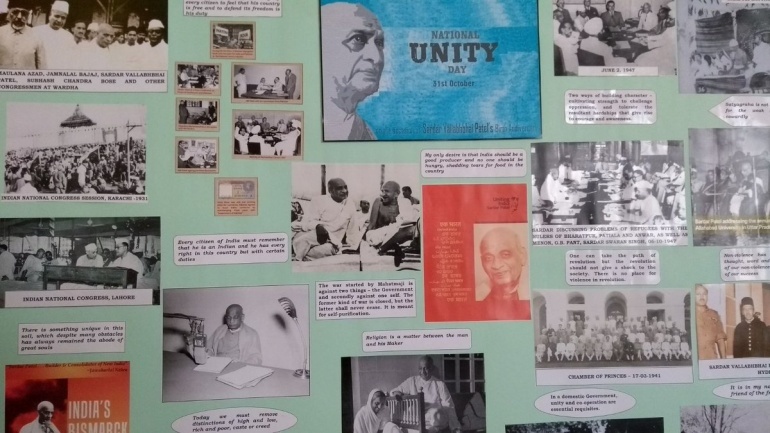 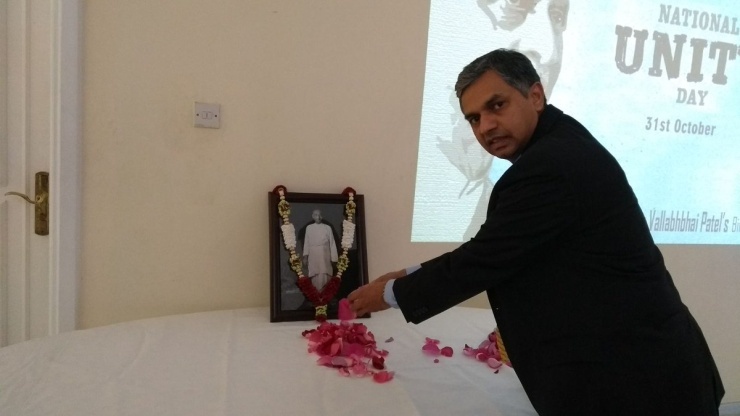 Indian Embassy observed the National Unity Day on 31 October, 2017 to commemorate the birth anniversary of Sardar Vallabhai Patel, the Iron Man of India. 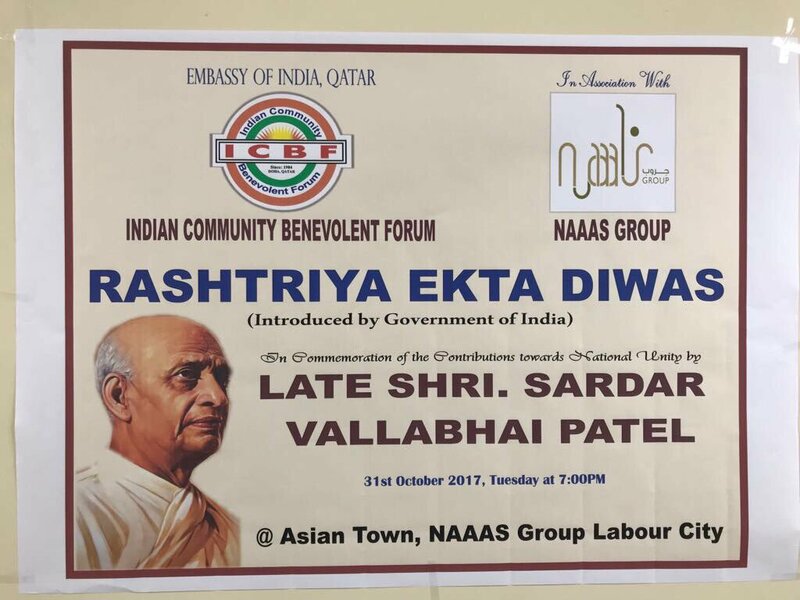 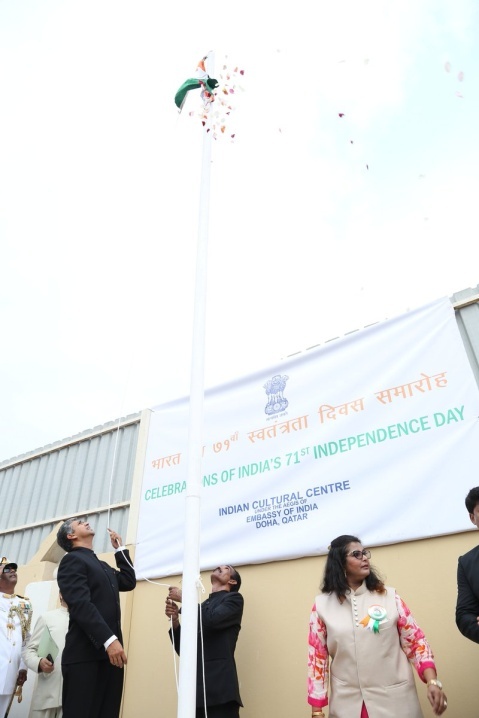 The organisations under aegis of Embassy of India, Doha celebrated National Unity Day on the birth anniversary of Sardar Patel. 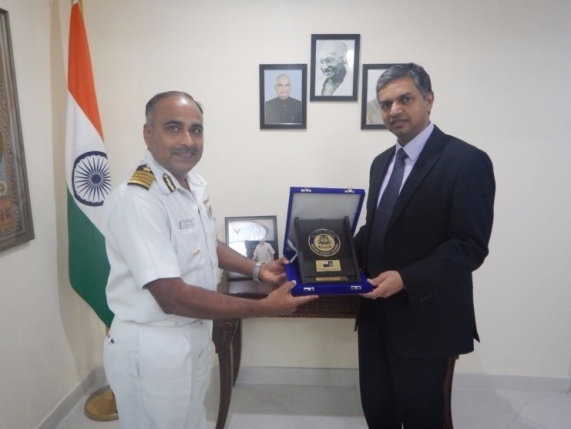 Ambassador P Kumaran visited ICGS Samarth on 04 November 2017. 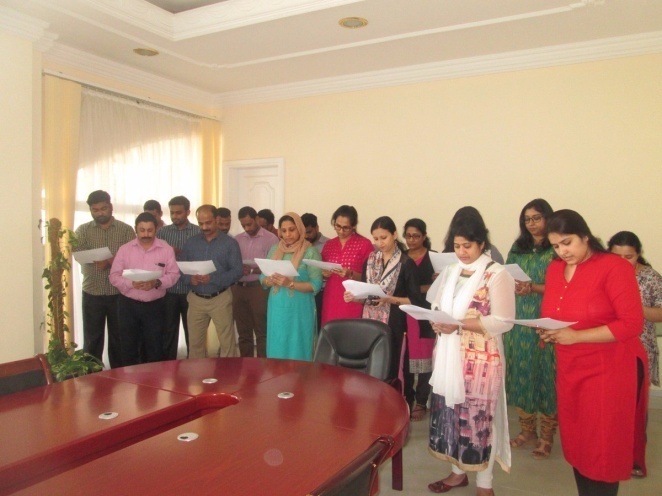 The Ambassador readout the preamble of the Constitution in Hindi & English in presence of all members of the Mission to celebrate 3rd Constitution Day. 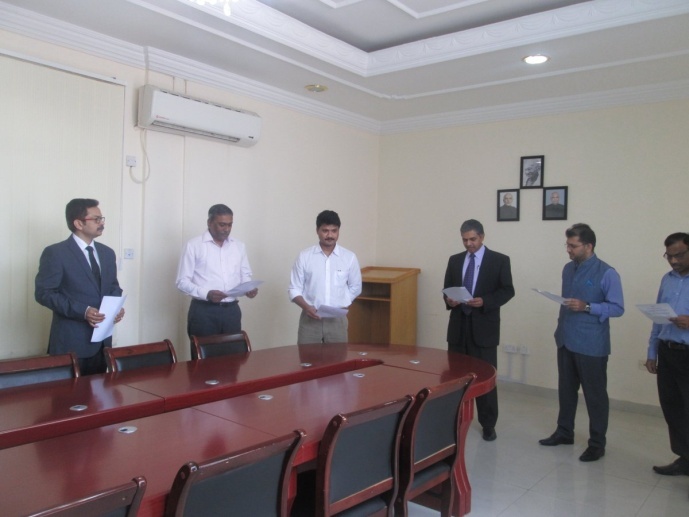 The officials paid tribute to all who lost their life during Mumbai Terror attack by observing one minute silence. 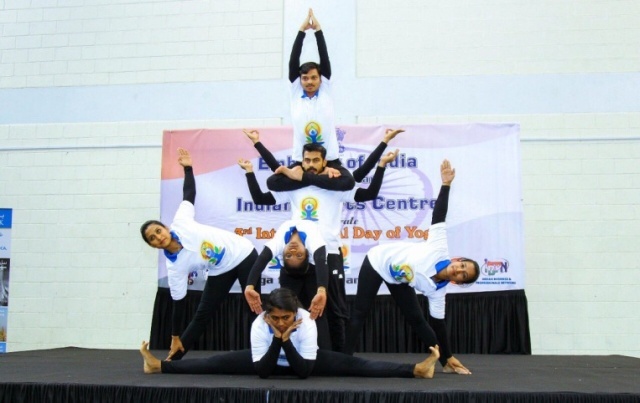 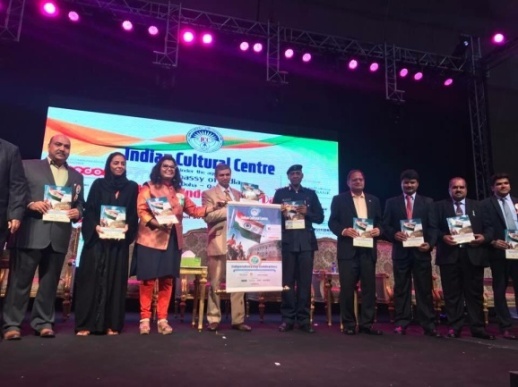 The Mission in association with the Indian Cultural Centre observed the Pravasi Bharathiya Divas 2018 (9th January). 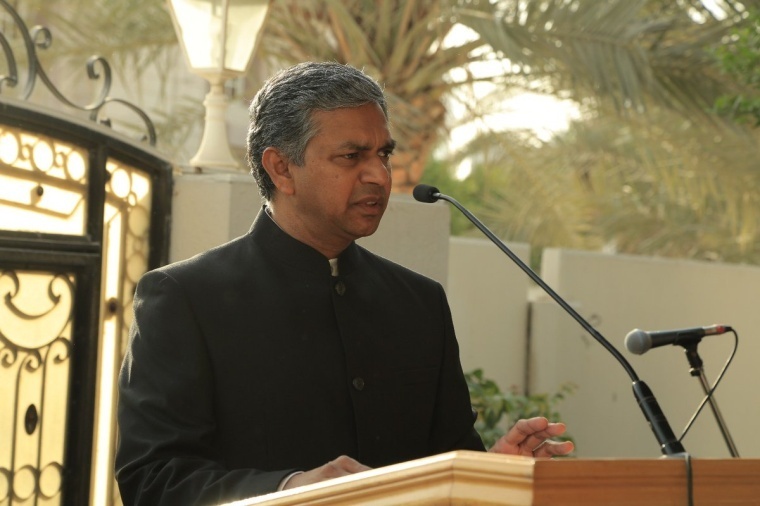 Speaking at the event, the Ambassador, Shri. 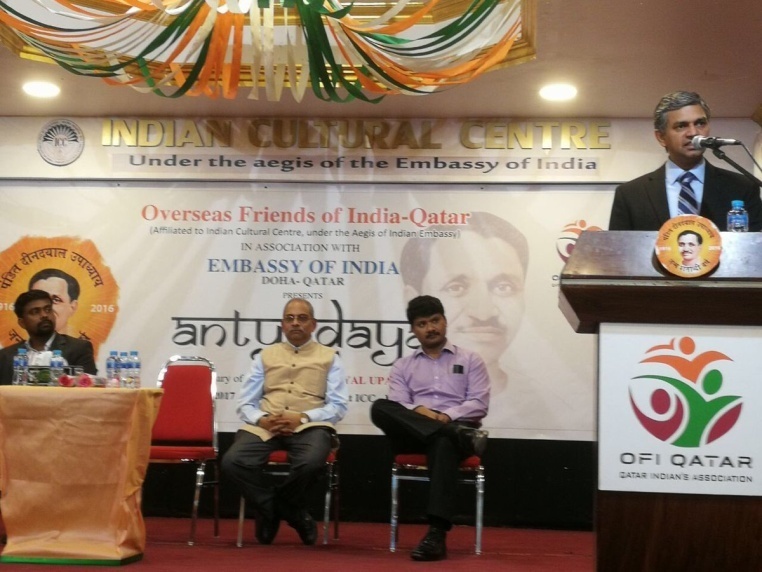 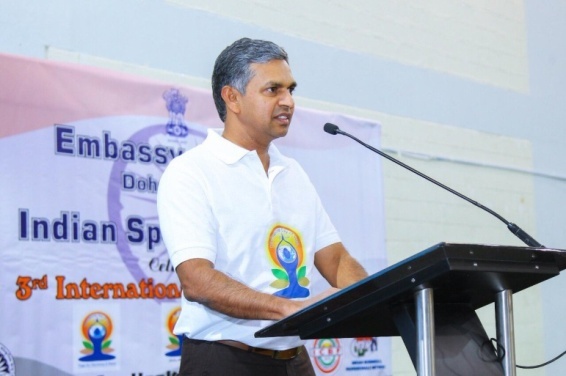 P. Kumaran appreciated the Indian Community in Qatar for their hard work and commitment which was well acknowledged by the Qatari authorities and requested them to continue and strive for the better. 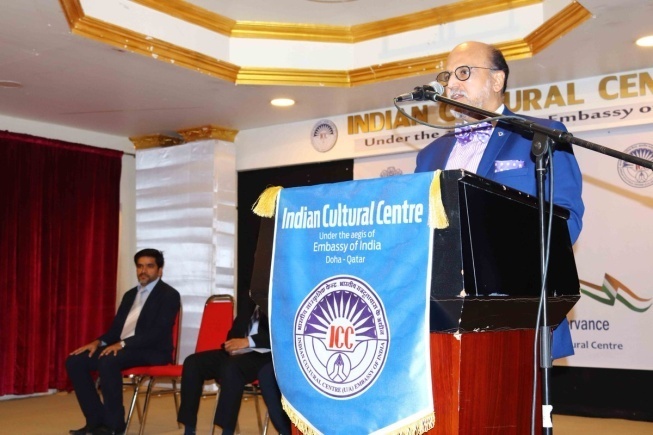 He also requested the Indian community to support the flagship initiatives of Govt of India. 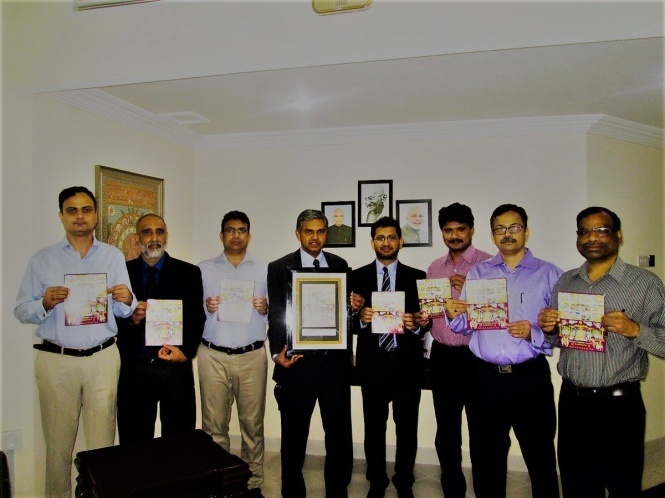 A film on Pravasi Bharathiya Divas (PBD) was screened together with remembrance of PBD 2017. 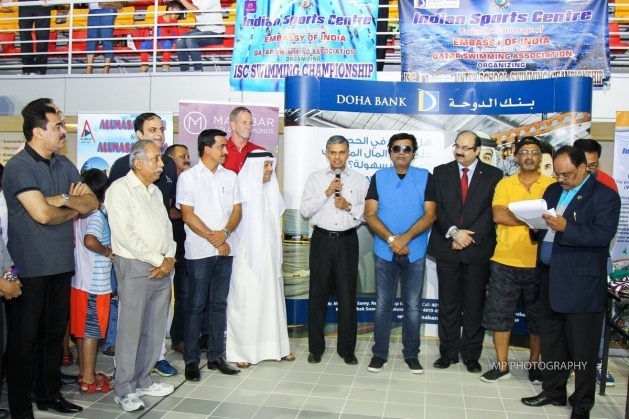 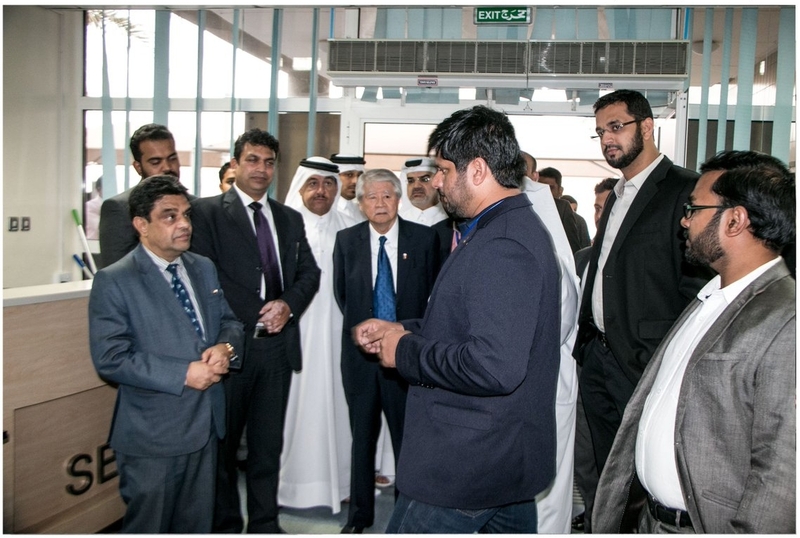 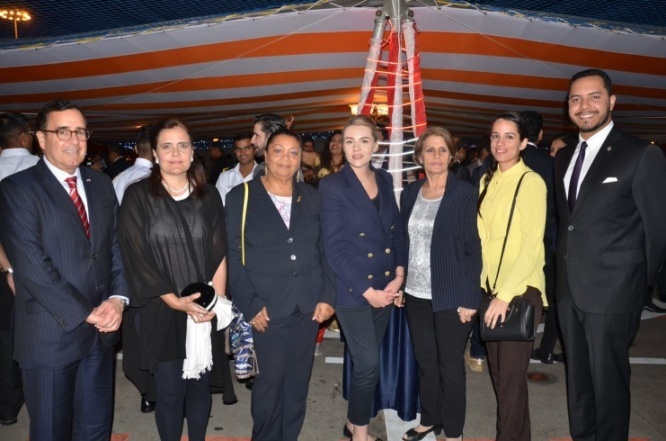 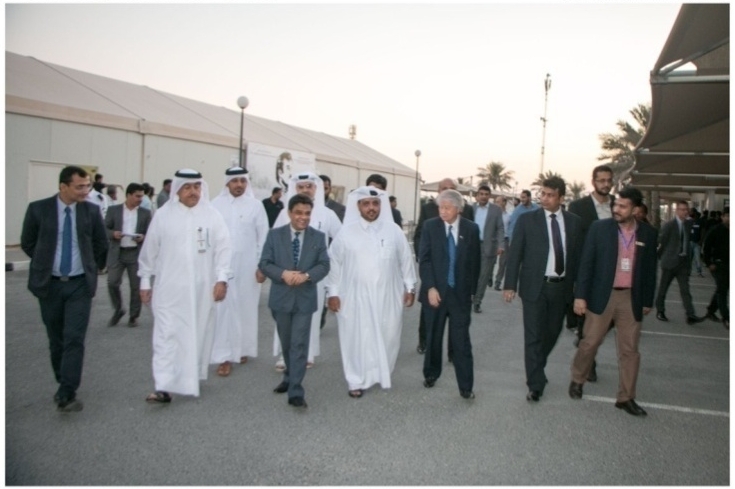 The event was attended by over 200 members from the Indian Community including last year’s PBD delegates from Qatar. 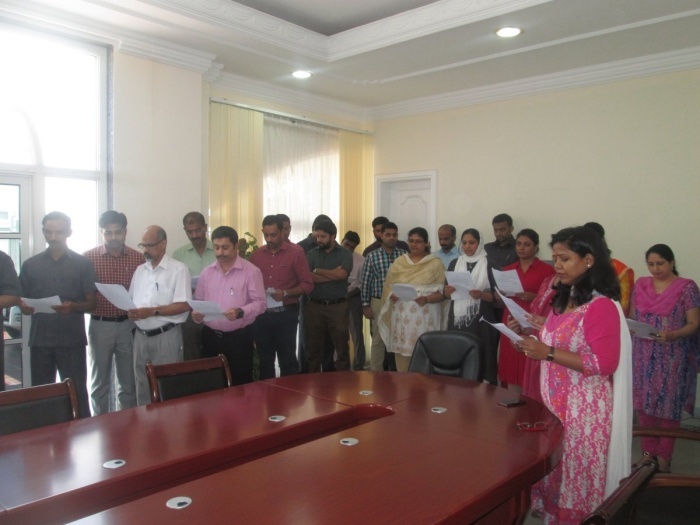 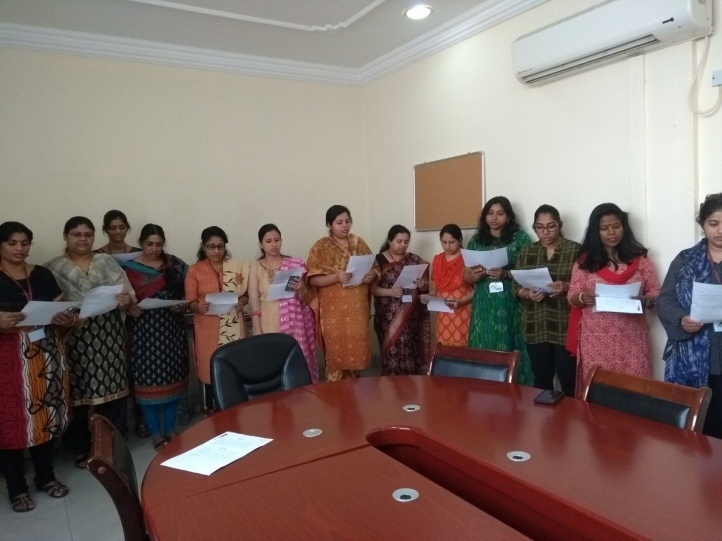 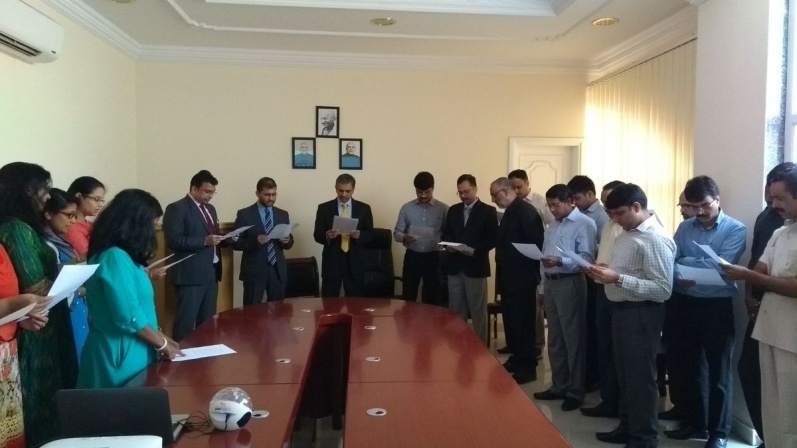 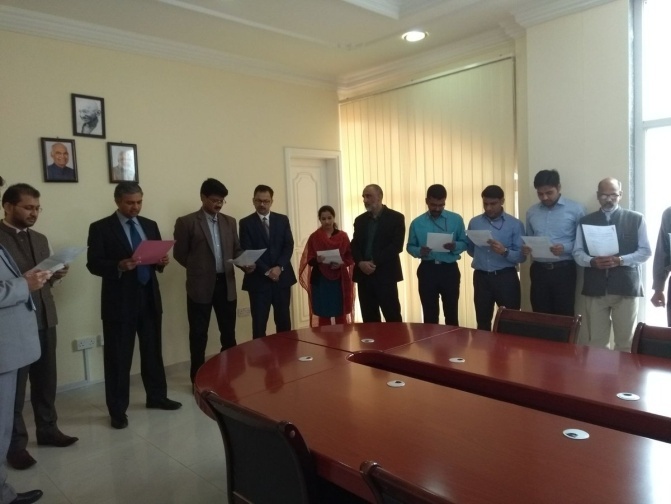 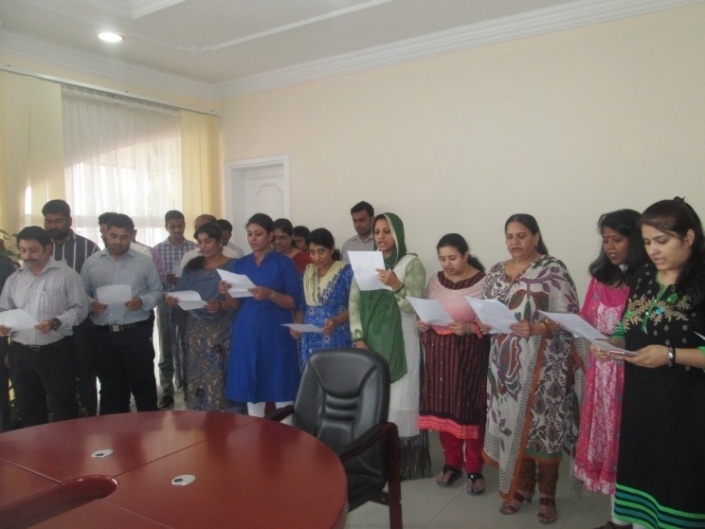 Ambassador Mr. P Kumaran administered pledge to the Embassy officials on 25 January, 2018, on the occasion of National Voters' Day to create awareness among the citizens on the importance of voting in a democracy and to affirm our commitment to democratic values and methods. 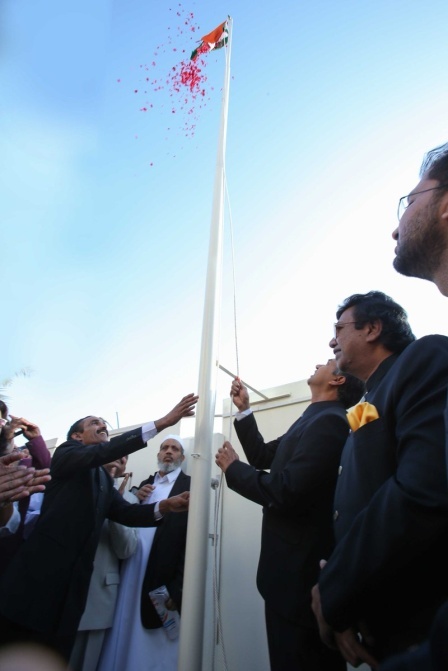 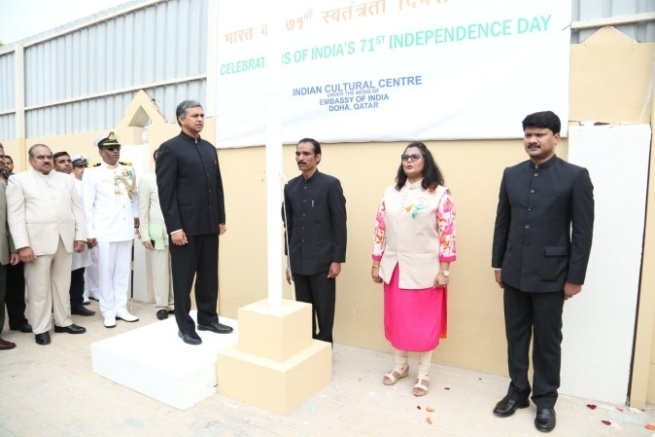 Celebration of India's 69th Republic Day at Embassy of India, Doha -26 January 2018. 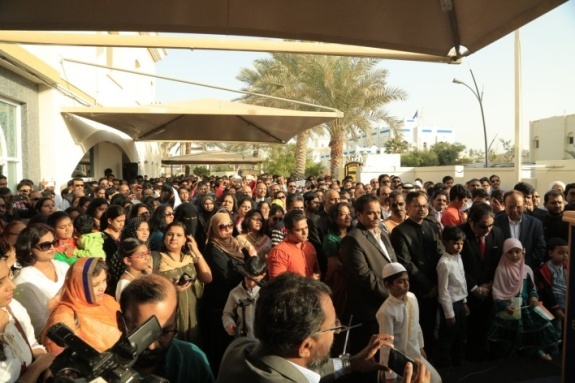 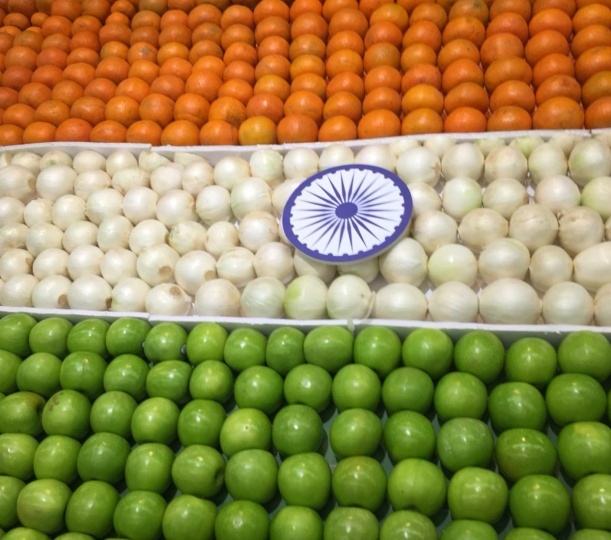 About 1000 Indians and friends of India attended the celebration. 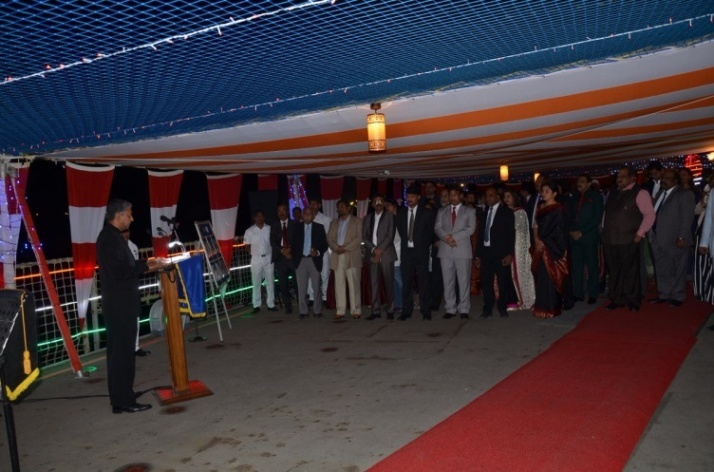 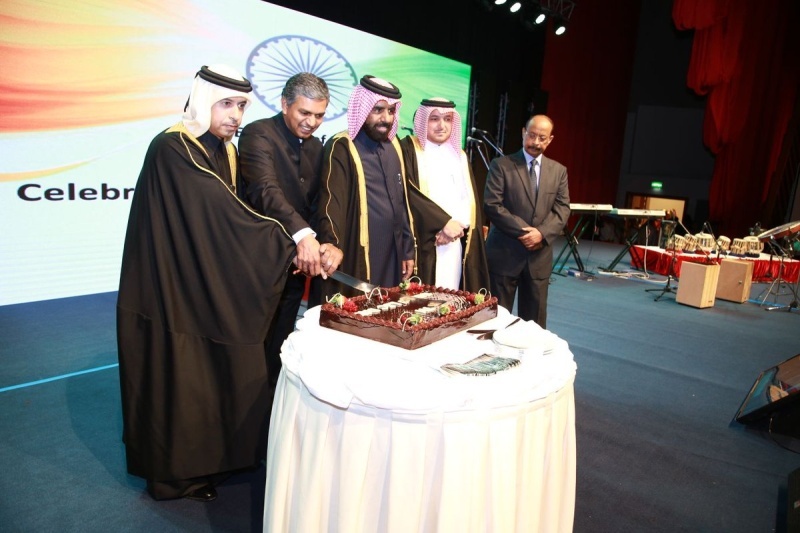 A reception was hosted by the Ambassador of India, to commemorate the 69th Republic Day celebration on 28th January, 2018 at Sheraton Hotel, Doha. 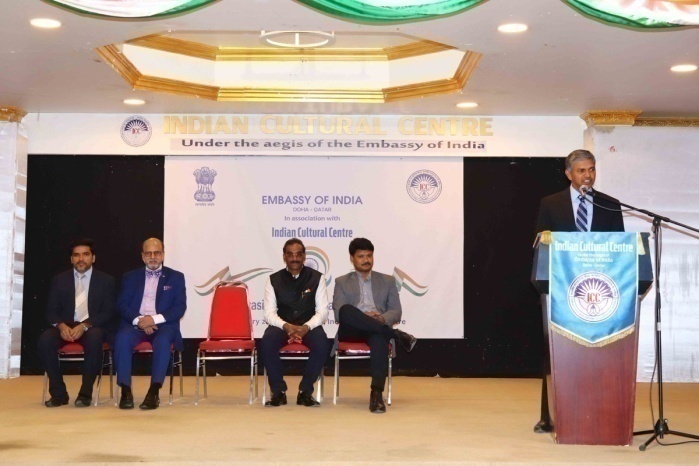 The Cultural show by the Indian students during the reception mesmerized the audience. 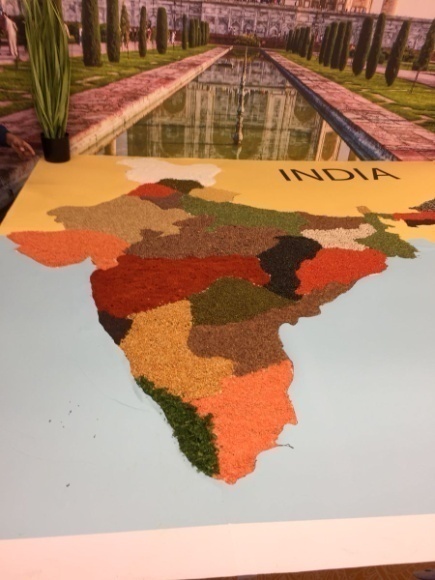 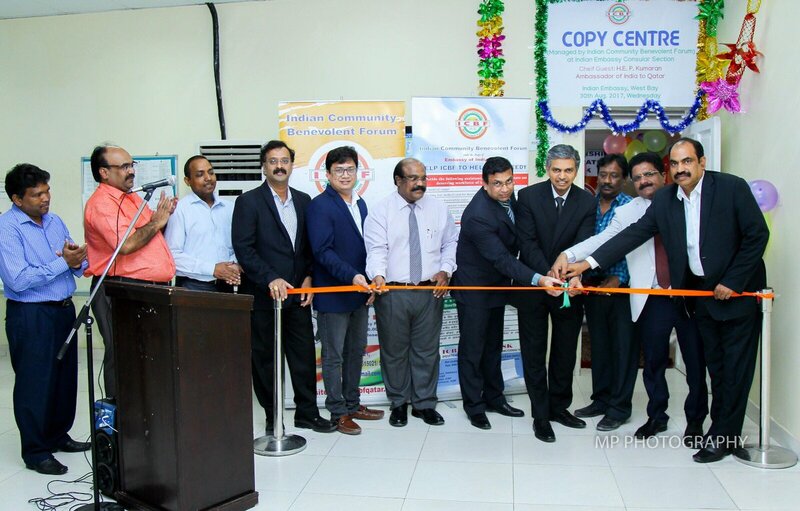 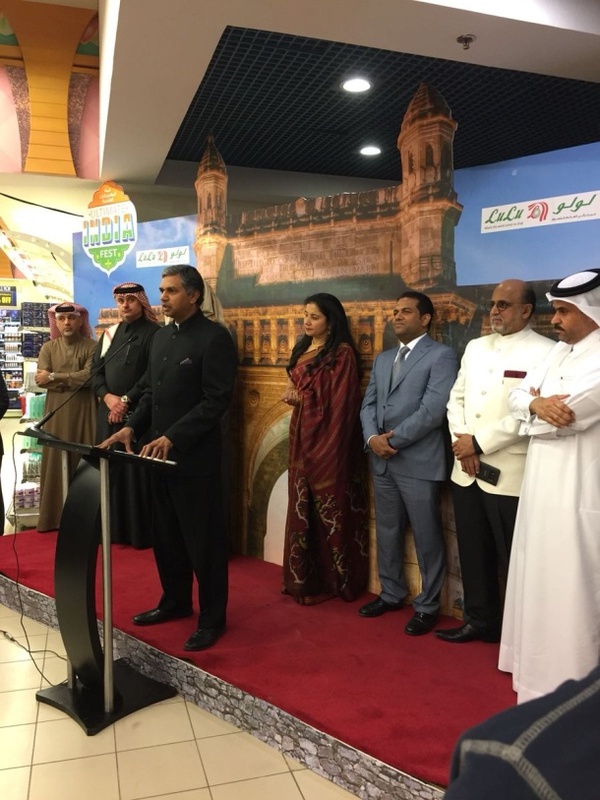 Ambassador, Mr. P. Kumaran inaugurated “Ultimate India” festival organised at Lulu Hypermarket, Al Gharafa (30 January, 2018). 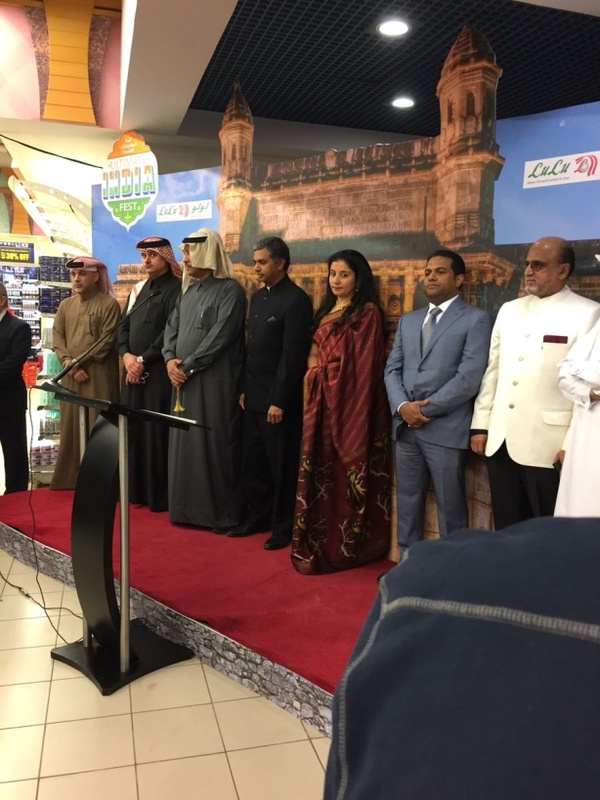 A promotion on Indian silk and ethnic wear was also opened by Mrs. Ritu Kumaran, wife of Ambassador, during the event. 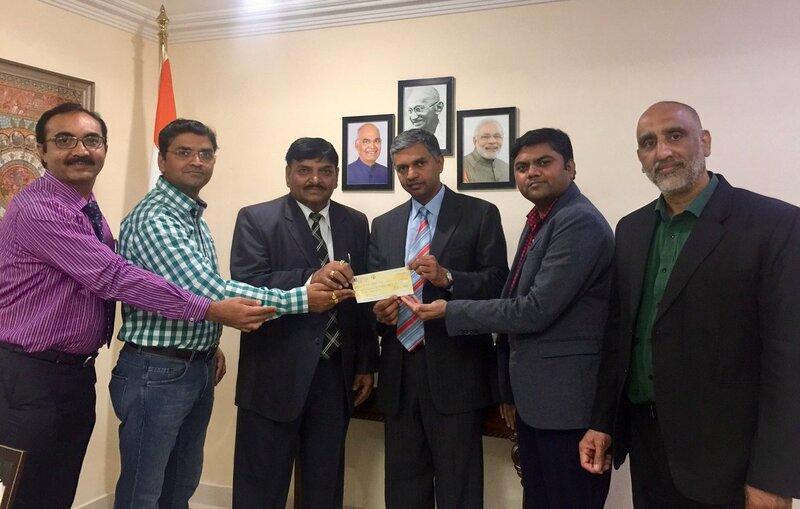 Our sincere thanks to Gujarati Samaj for their contribution of QR 4100 to the Swachh Bharat Kosh (2 March, 2018). 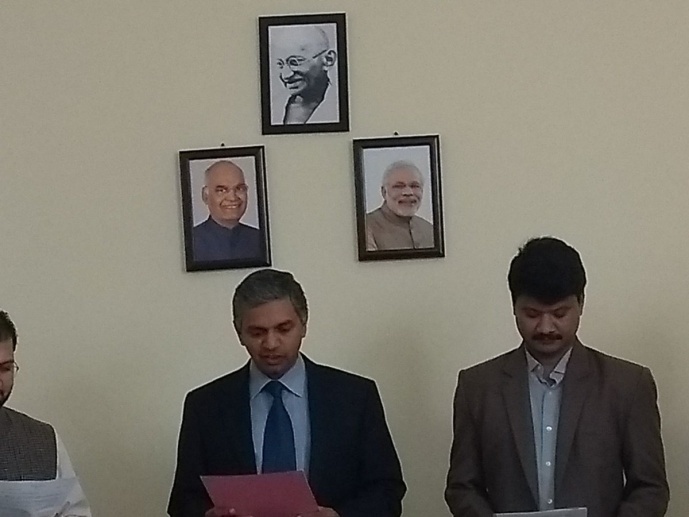 The EoI apreciate Hasmukhbhai Patel and other members of the Management Committee of Gujarati Samaj for their efforts. 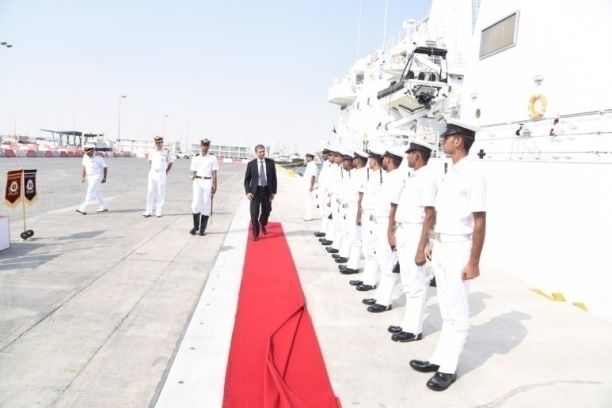 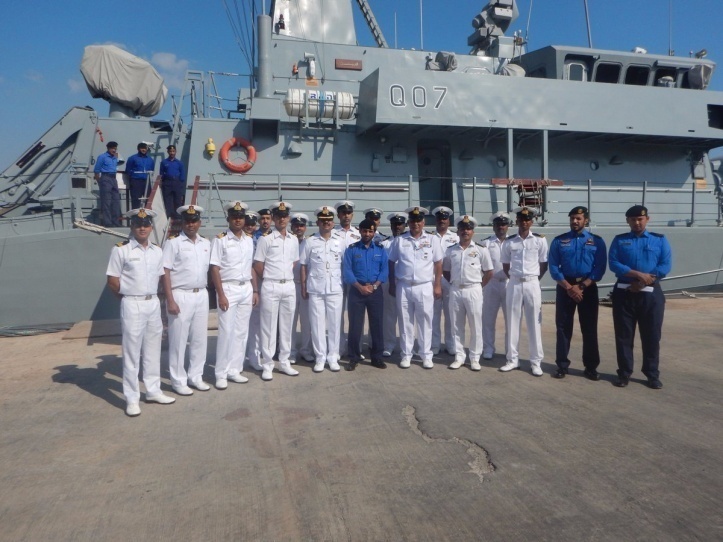 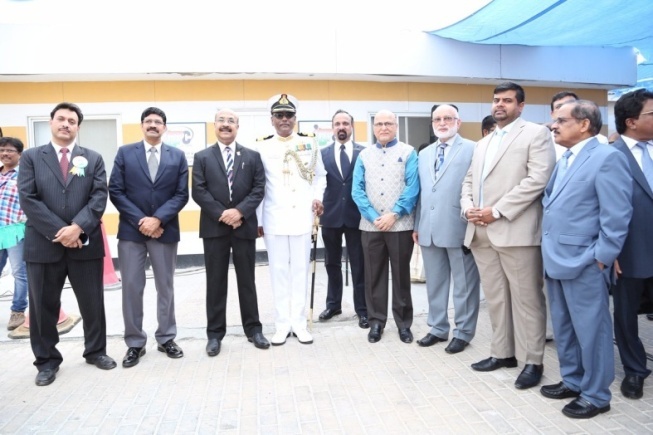 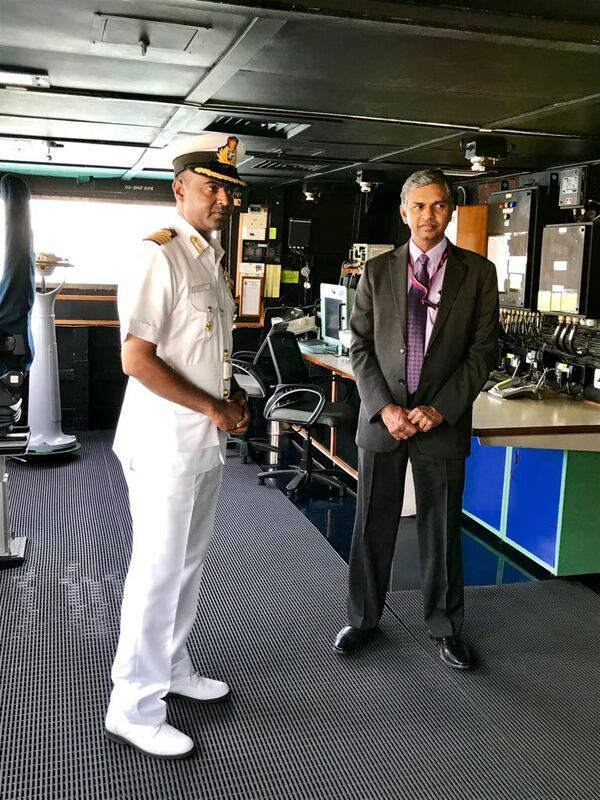 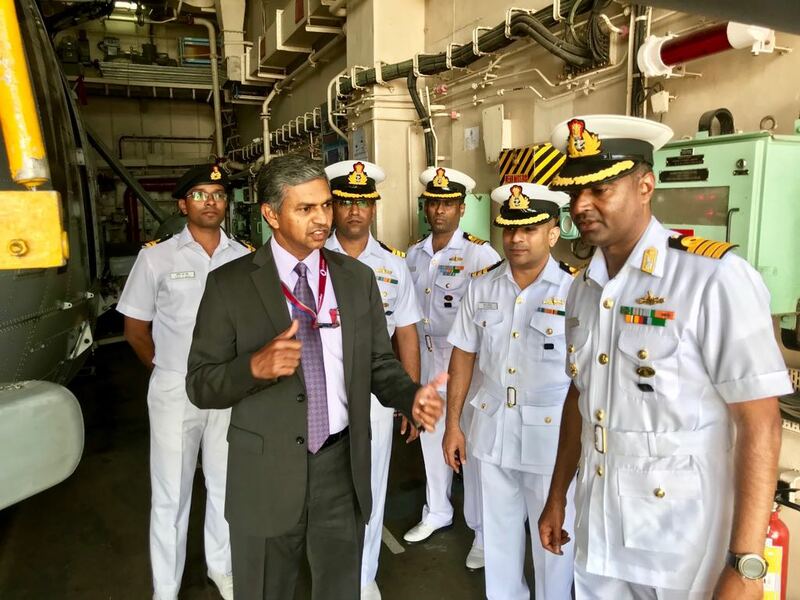 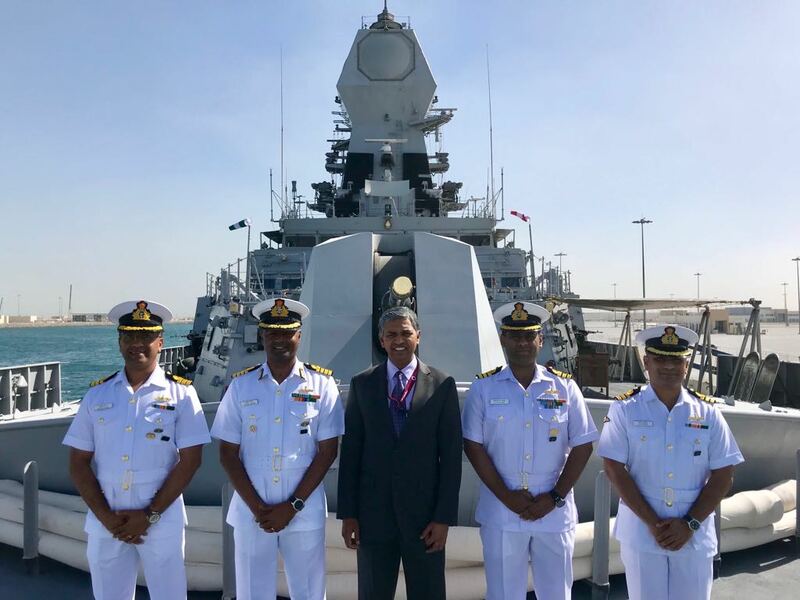 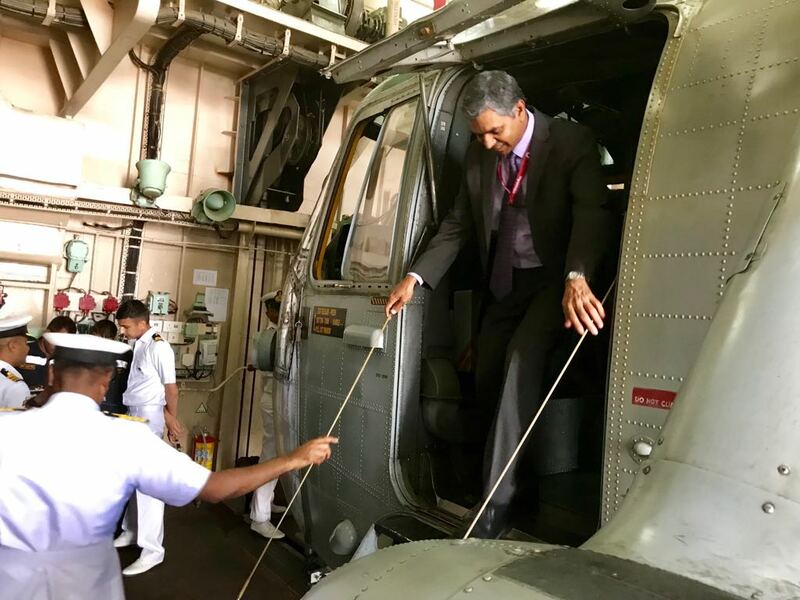 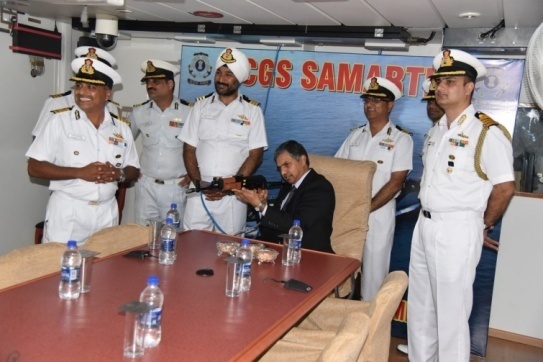 HE Ambassador P Kumaran onboard Indian Naval Ship Kolkata during DIMDEX 18 (12 – 14 March, 2018). 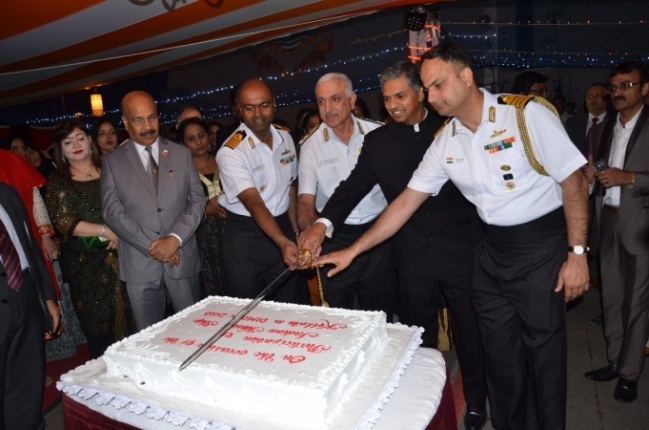 Dignitaries from Qatar Armed Forces, Ambassadors & distinguished guests from the diplomatic corps and vibrant Indian community members attended the reception onboard INS Kolkata hosted by Ambassador of India during the ship's visit to Doha to participate in DIMDEX 2018. 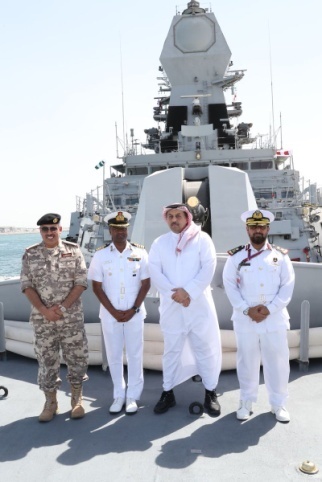 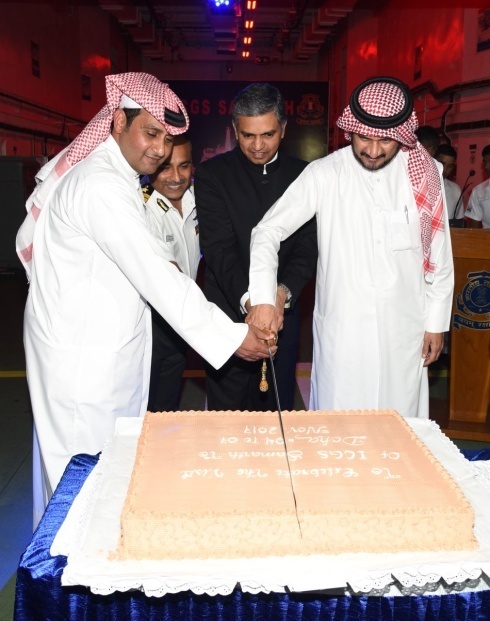 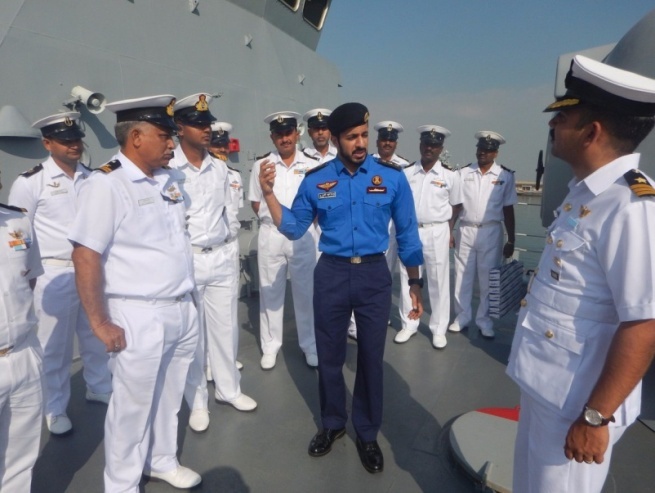 Deputy Prime Minister and Minister of State (Cabinet Rank) for Defence Affairs H.E Khalid bin Mohammad Al Attiyah onboard Indian Naval Ship Kolkata during DIMDEX 2018. 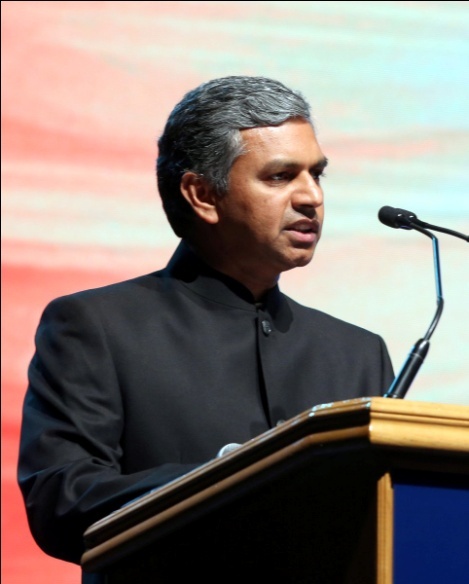 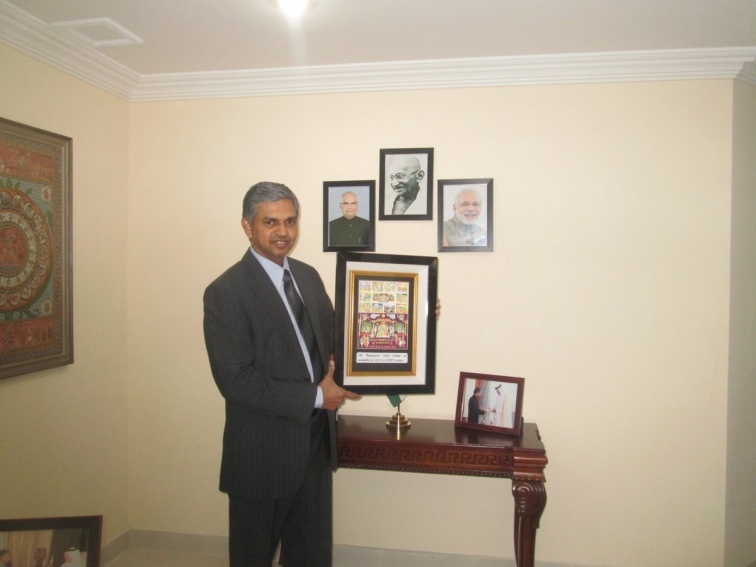 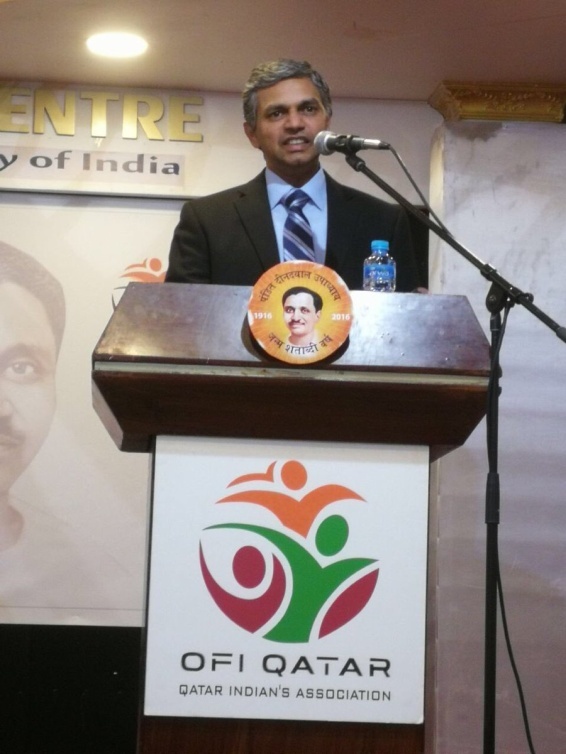 Indian Ambassador H.E. 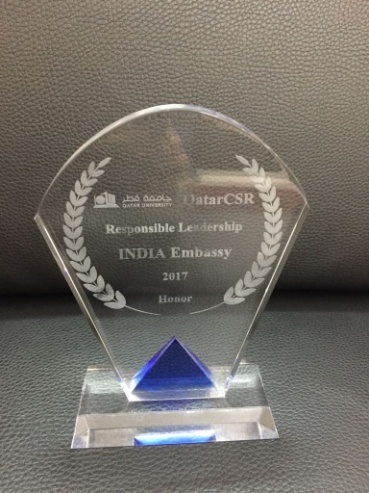 Mr. P. Kumaran receiving the CSR ‘Responsible Leadership 2017’ award from the President of Qatar University H.E. 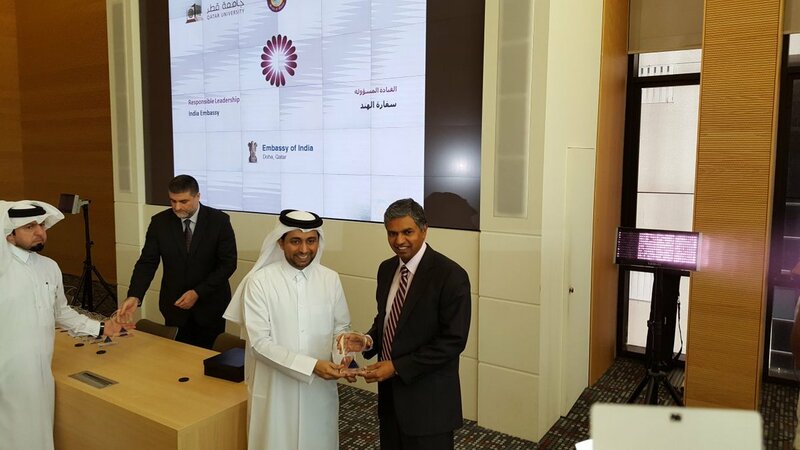 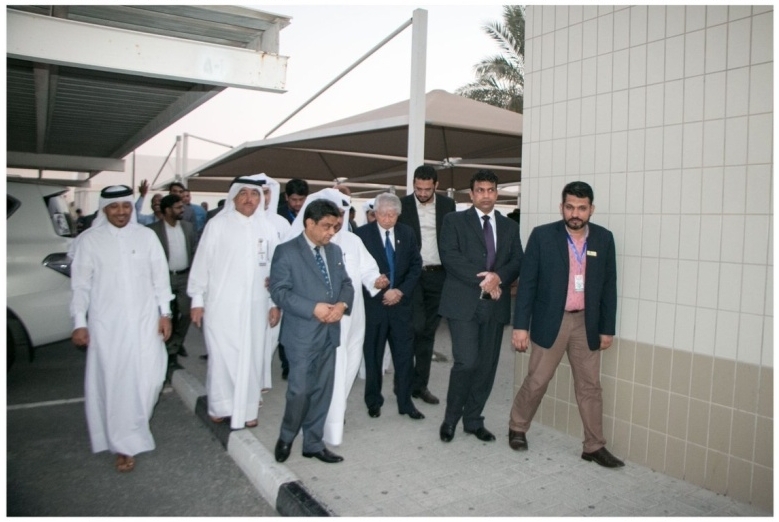 Mr. Hassan Rashid Al-Derham during a ceremony held at the Qatar University Premises in the morning of March 26, 2018. 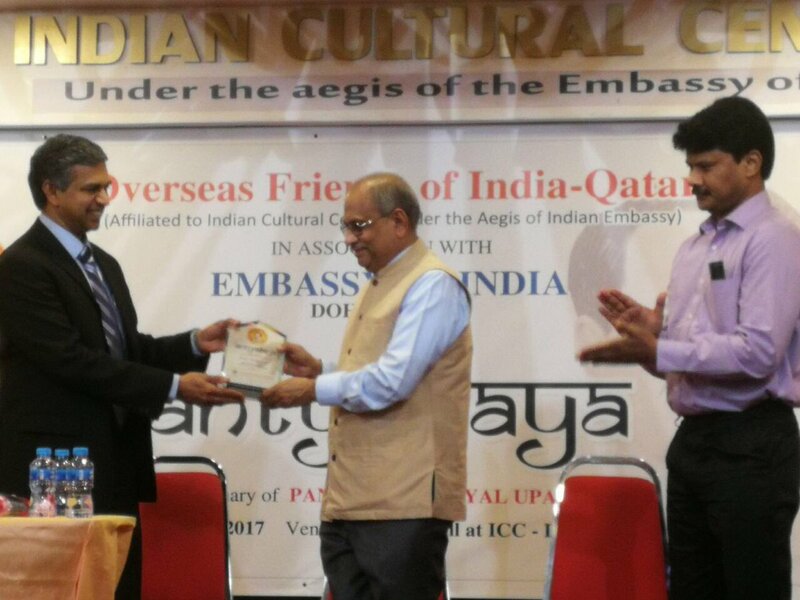 9-member Kathak Group led by Ms. Shama Bhate had visited Doha from 22 – 25 March, 2017. 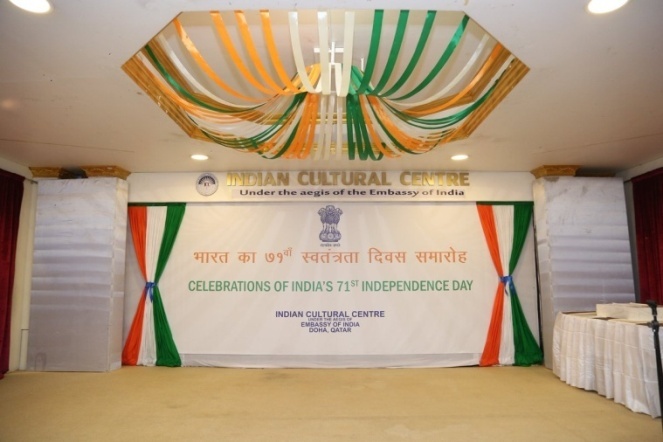 Embassy of India organised four performances. 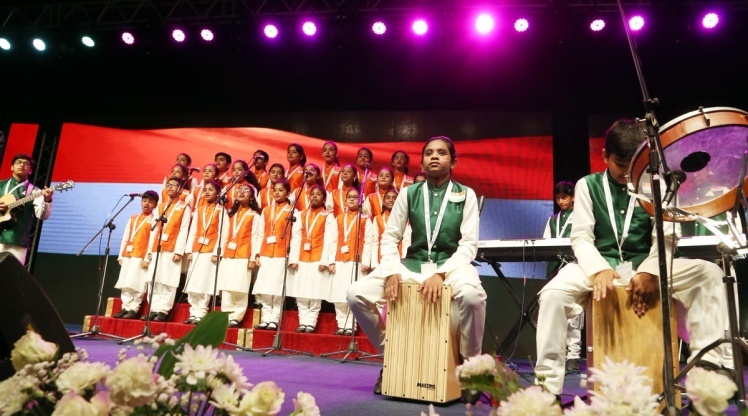 Two performances were held on 23 March – one in the afternoon at prestigious Hamad bin Khalifa University (HBKU), Doha and the second in the evening at Al Khor. 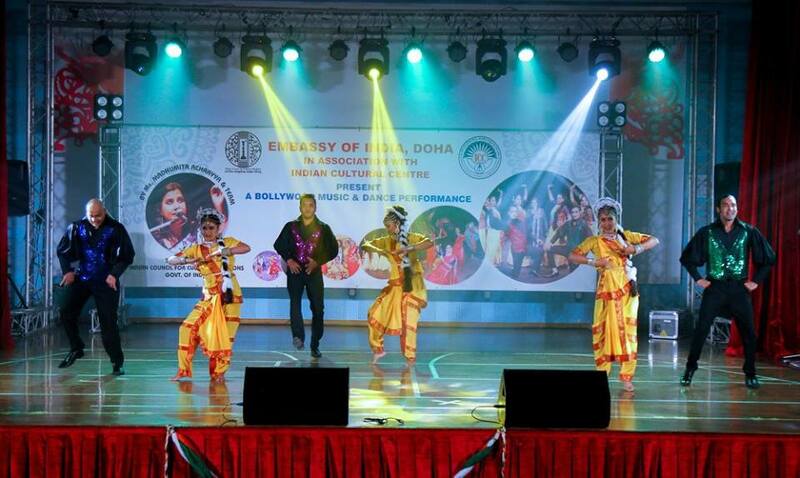 While the third performance was held at Ashoka Hall, Indian Cultural Centre, Doha on 24 March. 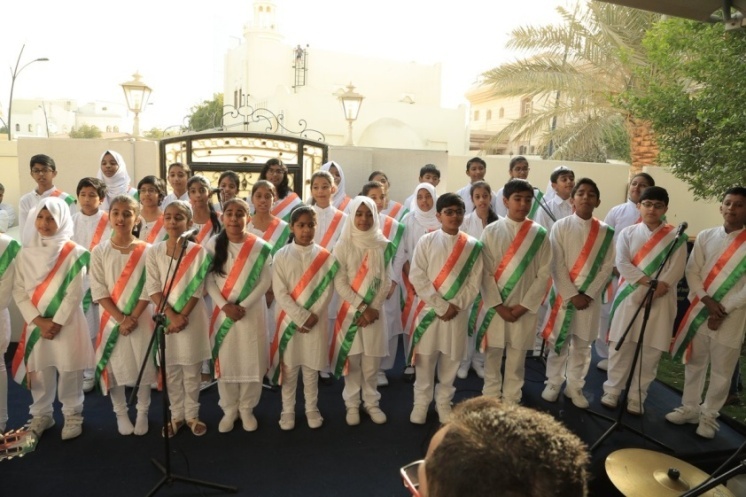 The fourth and final performance took place at Al Khayma Hall, Ezdan Hotel, Doha on 25 March. 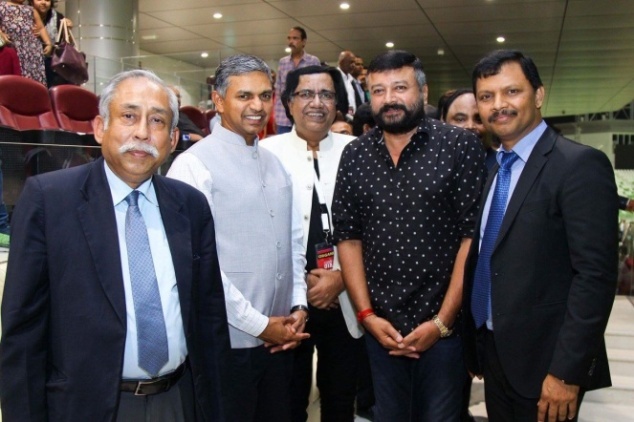 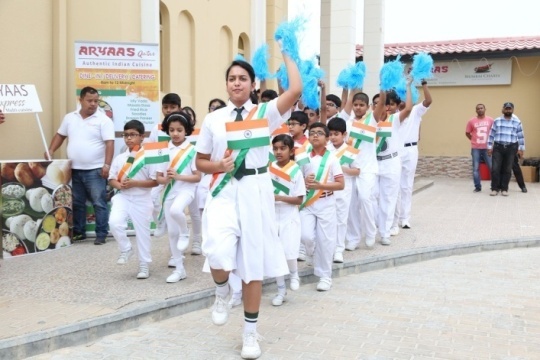 The Embassy of India, in association with Indian Cultural Centre (ICC), Doha organised a ICCR sponsored Bollywood dance performance at DPS-Modern Indian School in Al Wakrah on November 24 and at Al Khor on November 25. 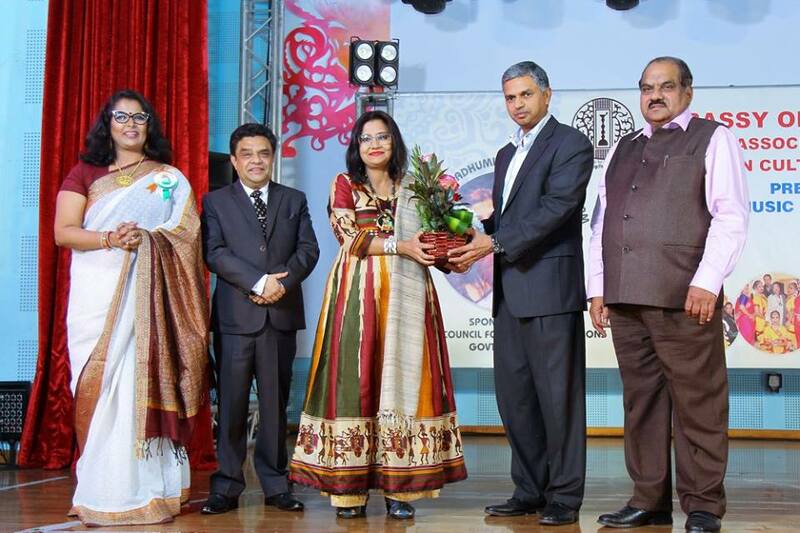 The troupe of 15 artistes was led by Ms. Madhumita A. Biswas. 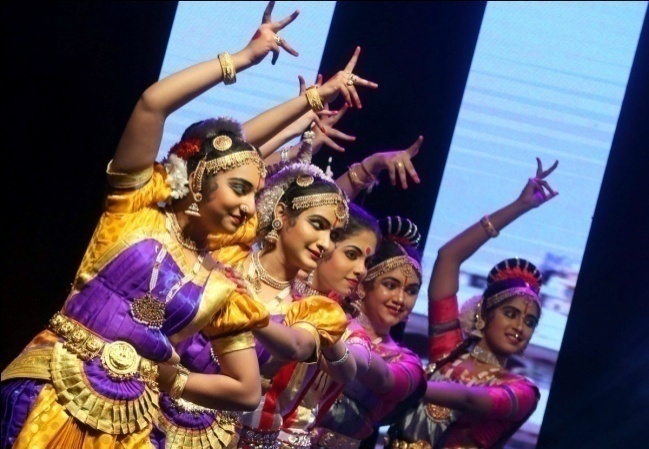 The performance lasted for about 90 minutes and included a wide array of musical numbers, such as Bollywood, classical, Punjabi, Malayalam and Tamil music.